A friend of mine was convinced that he had a Moff Tarkin figure in the 1970s. Regular readers of Dirk Malcolm will know that this is impossible, as the figure wasn’t manufactured until the 1990s. It took an old catalogue, internet searches and the signed witness statement from a Kenner expert, to convince him that he had a false memory. For my friend, the phenomena of false recollections are now known as ‘Moff Memories’. These ‘Moff Memories’ can strike anyone at any time. After watching EXCALIBUR a couple of times over the past couple of weeks, mulling over its inclusion in the list for purely nostalgic reasons, I decided to search the loft to find the issue of STARBURST that first got me excited about the film. The earliest mention of the film was in STARBURST Vol. No.4 Nov. 1978, an issue staring thick-faced Lou Ferrigno grimacing on the cover to illustrate the feature article ‘Hulk in the Media’, it was a Marvel magazine after all, and they never missed the opportunity to cross-promote other ‘product’. In the seventies of course, we would have been impressed that he had hot and cold running water, never mind a sauna, “you were lucky” etc etc. 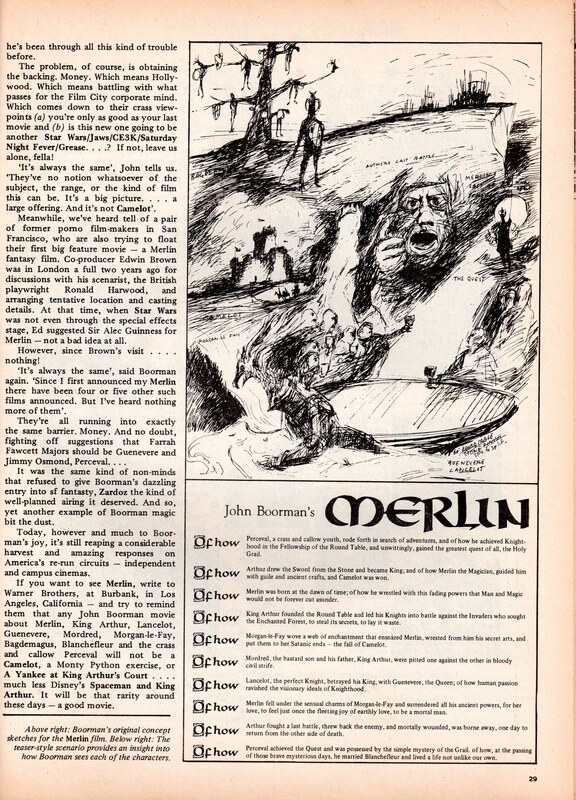 The article says that Boorman had been rewriting, polishing the story of the search for the Holy Grail for fifteen years and that his fascination with the legend had influenced the themes and story-lines in his other films. On reflection, it is possible to see elements in POINT BREAK (1967), DELIVERANCE (1972) and, most significantly, his science fiction, cult classic ZARDOZ (1974), which features an uncomfortable looking Sean Connery in a Borat swimming costume. Interestingly, at this stage, the grail quest was to be delivered from the point of view of Perceval ‘a crass and callow youth’, who is elevated to greatness after discovering the ‘simple mystery’ of the Holy Grail before going on to live a hum drum married life. 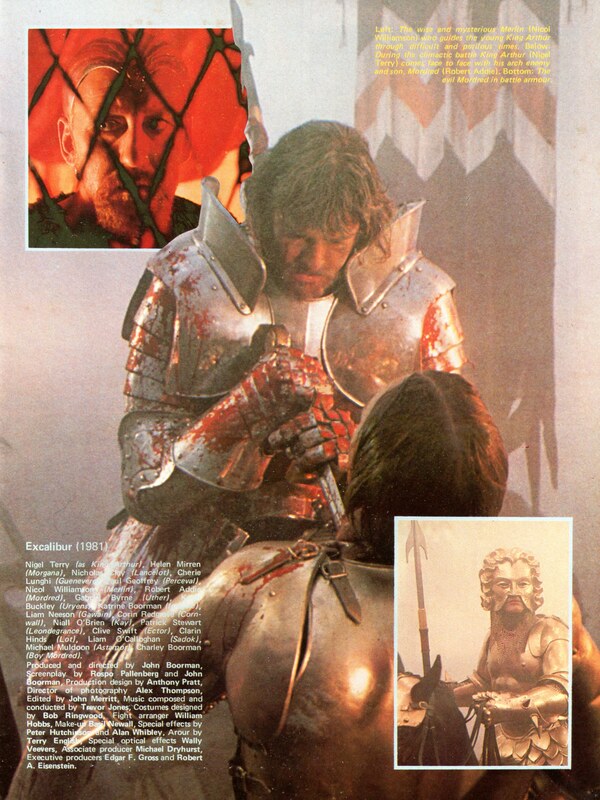 Although EXCALIBUR concentrates on Arthur struggling with his destiny, it is still possible to see elements of the original treatment which is published alongside the article, complete with Boorman’s concept drawings. Hold on a moment. My memory was of being excited at the prospect of seeing EXCALIBUR based on STARBURST’s recommendation. Does that mean that the concept drawings created such an evocative hold on me for three years? No. The first ever issue that I bought was the one with CLASH OF THE TITANS on the cover. I bought the earlier one as part of a job-lot bundle on ebay last year. I was clearly seduced by colour pictures rather than reading the accompanying review. Colin Baker stands out. First time that you’ll hear that sentence. The Matt Smith one looks like a young Michael Palin.